You are here: Home / Blog / General Information / Making Old Jewelry New… You Will Be Amazed! Making Old Jewelry New… You Will Be Amazed! Do you have old, out of style jewelry items that are sitting in your jewelry box that never get worn? Don’t scrap them, re-purpose them! Gold can be recycled. Jewels can be reconfigured and reset. 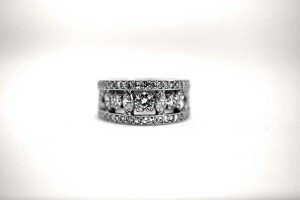 We can create a brand new jewelry item for you from those old items. This is a story that happens daily. A client comes in with a bag of rings, chains and bracelets that they aren’t wearing any more because they are damaged or out of style. 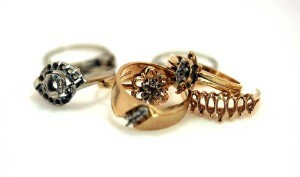 They would like to know how we can help them turn their old items into a beautiful new jewelry creation. We specialize in custom, in-house jewelry creation. Once a design is agreed on, Karen removes all the stones from their settings to get perfect measurements. She then designs the new item using CAD (Computer Aided Design) software for a 3D representation of what the finished item will look like. Next, a model version of the item is 3D printed in true size and scale, so the client can see, touch and feel what it will look like when worn. After final approval, the model is cast in the material of choice, stones are set, and everything is detailed and polished. This is where House of Diamonds is different than other jewelers. 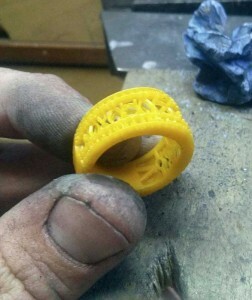 At this stage, most jewelers outsource the entire project for casting and finishing. We do everything in house to make sure the original design intent is maintained. It’s so important to maintain control over this part of the process to make sure that the client’s requests are being met. It’s also good that we do everything in house for security reasons. You can be confident that the stones in the finished product are actually the stones that you originally brought in. Karen and our master jewelers work hard to make sure the new item is finished exactly the way the client was hoping for. And you should see the joy on their face when they see the new item! The before and after pictures do a great job of showing what is possible. THEY MADE THEM INTO ONE BEAUTIFUL RING. THANKS GENE AND KAREN .